This Mother’s Day, Adopt a Rose for Mom (and anyone who symbolizes “Mom”!) 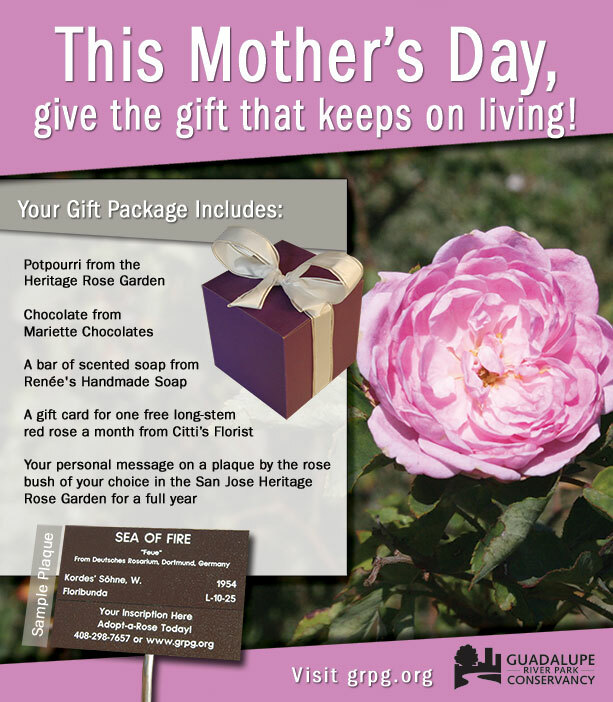 at the San Jose Heritage Rose Garden and give the gift that keeps on living. Come see the garden in bloom! Volunteers will be on hand to help you locate your rose and learn about the garden, and refreshments will be provided. Pre-order online and we’ll have your gift package waiting, just in time for Mother’s Day! Or choose your rose and take home your gift package the same day. Rose adoptions are partially tax deductible and help support the upkeep of San Jose’s Heritage Rose Garden. Click here to Adopt a Rose.